Investigation of incident along Gaza border finds 20 terrorists placed explosive device along the fence, detonated it and broke in. The IDF has released additional details about Friday’s violent incident on the Gaza border, in which terrorists were eliminated while attacking an IDF position inside Israel. An investigation into the incident, which took place in central Gaza, found that terrorists had placed an explosive device on the security fence during a disturbance. The detonation of the explosive device opened a hole in the fence through which about 20 terrorists entered. The terrorists were immediately identified by Israeli forces who opened fire at them, said the IDF Spokesperson’s Unit. Most of the terrorists returned to Gaza. A number of terrorists approached a military post and the forces fired at them, eliminating them, it added. 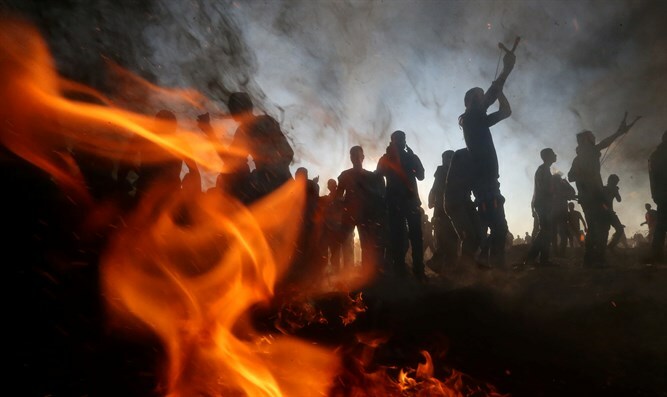 Friday’s incident came as the weekly Hamas-sponsored “March of the Return” riots along the Gaza-Israel border continued, with approximately 14,000 rioters and demonstrators gathering along the border. The Hamas-run “health ministry” in Gaza claimed that six Palestinian Arabs were killed in the clashes along the border. It said the six men, ranging from 17 to 29 in age, had been killed as thousands of protesters approached the heavily-guarded Israeli border.